When I saw this idea a few months ago I immediately emailed both my Mom and my husband to demand that no one, in either of our respective houses, ever throw away another dress shirt. It might take a few years to gather up enough used shirts to make a quilt like this, but I am determined to have one (or two). This is probably going to sound pitiful, but one of my most prized possessions is a t-shirt quilt that my Mom made for me. When my college days were over we realized that I had tons (literally) of t-shirts that would never see the light of day again. 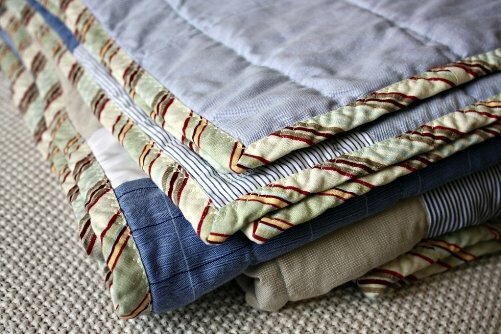 Instead of donating them or making them into rags she cut them into squares and sewed together the softest, most sentimental blanket on the planet. Its quite literally a map of my college experience. 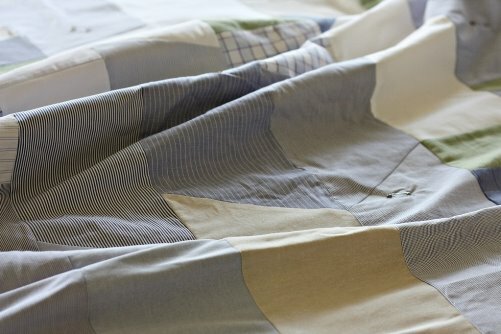 I have a strange attachment to blankets already, but when I saw the idea for the dress shirt quilt I knew that I had to have one. Well, ideally I'll have one from all of Brad's shirts and another from all of my Dad's (which sounds a little twisted when I write it, but whatever. Don't judge) It is such a great way to recycle something and turn it into a sentimental memento. Email the men in your life now and get them to start saving those shirts! For my college graduation, my mom had a quilt made of all my sorority tshirts that I had. It's so fun and a great way to remember without holding onto a ton of tees that would just sit in my drawer. 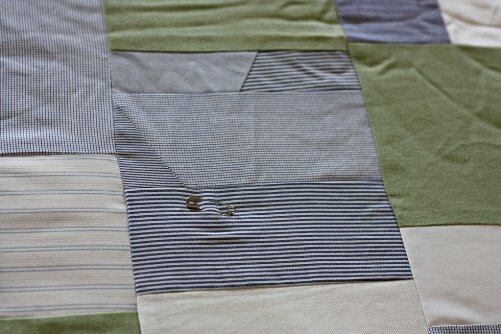 This is a great idea as well and would be perfect for a baby quilt! Fab idea! I have two tee shirt quilts...one from high school [all sports tees, bball and vball] and one from college [all sorority tees]. I love to look at both of them and they are quite toasty, too. But the mens' shirt idea is awesome! I am going to be making a quilt from my favorite baby clothes once the kids are out of them. What a great idea. I am saving all of my children's clothing for a quilt when they graduate someday. A Little Rain Must Fall..